Since SCPl behaved in many ways similarly to well-characterised plasmids such as the F-factor of E. coli, it was reasonable to suppose that it would be physically similar as well. It was therefore natural to try to isolate it by CsCl-ethidium bromide density gradient centrifugation. Application of this technique to S. coelicolor indeed yielded CCC DNA, of about 30 kb (Schrempf et al. l975), but this proved to be present even in SCPl-free strains, and was designated SCP2 (Bibb et al. l977). Nevertheless, physical evidence that SCPl existed as DNA came from two kinds of experiments: DNA renaturation using S. coelicolor strains and a strain of another species, S. parvulus, into which SCPl had been transferred by conjugation revealed that the presence of SCPl was associated with a significant amount of DNA (more than 100 kb of unique sequence) (Hopwood et al. 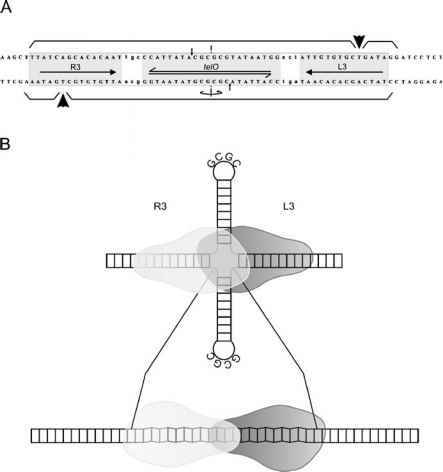 l979); and fragments of SCPl were cloned in the early 1980s (Bibb et al. l980; Chater and Bruton l983, l985). the usual alkaline extraction method for plasmid isolation denatures and precipitates most linear DNAs.) The copy number of this DNA was about 60 per chromosome (Hirochika and Sakaguchi 1982). 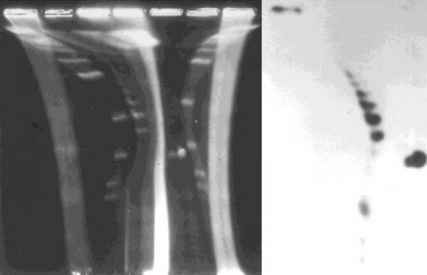 It was deduced that proteins were bound at or close to the ends, since the plasmid end-fragments were not seen on agarose gels when DNA prepared without the usual help of pronase was digested with restriction enzymes, and subsequent pronase digestion resulted in their full representation. Hirochika et al. (1984) went on to show that only the 5'-ends were linked to a protein. They also sequenced about 800 bp from each end, and found that both ends had the same sequence for 614 bp. The presence of 5'-linked proteins, often at the ends of terminal inverted repeats (TIRs) of various lengths, has turned out to be a general feature of linear replicons of actinomycetes, the terminal proteins playing a key role in the replication of the ends (Bao and Cohen 2001; see Chen 2007, in this volume). Multicopy linear plasmids of tens of kilobases can be detected in some other streptomycetes by conventional gel electrophoresis (e.g. S. rimosus, Chardon-Loriaux et al. 1986; S. clavuligerus, Keen et al. 1988), but they have not so far been shown rigorously to carry genes for recognisable phenotypic traits, or to interact physically with the host genome. It was not until the advent of various kinds of pulsed field gel electrophoresis (PFGE; Schwartz and Cantor 1984; Carle and Olson 1984) that very large linear DNA molecules were revealed by the work of H. Kinashi. These PFGE techniques all depend on frequent changing of the direction of the current during electrophoresis, which requires linear DNA molecules to realign, a process that takes longer for larger molecules. Shearing of the DNA is minimised by preparing it from mycelium immobilised in an agarose plug. The full preparation in the plugs includes successive treatments with lysozyme, pronase and detergent, before the plugs are embedded in the electrophoresis gel. The Kinashi laboratory's extraordinary first results were published in two papers (Kinashi and Shimaji 1987; Kinashi et al. 1987). They found one or more linear plasmids ranging from 17 to 590 kb in six out of 12 antibiotic-producing streptomycete (strains) tested (Fig. 3). (Although these have often been called "giant" linear plasmids, it is clear that there is a continuum of sizes of linear plasmids from 17 to hundreds of kb, so we have not retained the term in this chapter.) One of the strains examined was S. coelicolor A3(2), in which it was found that a series of plasmids varying in size from 410 to 590 kb in ca. 30-kb increments was made up of forms of SCP1 (using as probe a cloned fragment of SCP1 carrying resistance to methylenomycin—see below and Fig. 4). No bands were found in a strain genetically defined as lacking SCP1, and strains carrying SCP1, but not SCP2, had only a single SCP1 band of 350 kb. Subsequent work showed that the bands forming the ladder in the A3(2) strain arose from the integration of tandem copies of SCP2-derived sequences into SCP1 (see below). similar protein-linked ends (Lin et al. 1993; Chen 1996; Chen et al. 2002). Cytological evidence in support of spatial co-location of the ends of the S. coelicolor chromosome was obtained by Yang and Losick (2001), using fluorescence in situ hybridisation to probes ostensibly specific for each end, but it was subsequently found that the particular strain used in that work (J1508) possessed a duplication compared with the sequenced strain M145 that would have resulted in both probes hybridising to the same end (Weaver et al. 2004; C.W. Chen, personal communication). At least some of the linear plasmids are evidently transmissible by conjugation (SCP1, Vivian 1971; SLP2, Chen et al. 1993), but the absence of genetic markers on many of them has limited analysis of this aspect. Their copy numbers vary from several tens per chromosome in the case of the small plasmids to just a few-fold for the larger examples; but at least for SCP1, which typically has a copy number of up to seven in S. coelicolor (Yamasaki et al. 2003), the copy number was greatly increased in an SCP1+ derivative of S. parvulus obtained by interspecific conjugation (Hopwood and Wright 1973a; Chater and Bruton 1983).